Journey across Turkey on a luxury tour meticulously crafted for a richly rewarding educational and enjoyable experience. Depart for an overnight flight via Istanbul to Kayseri, a large and industrialized city in Central Anatolia, Turkey. 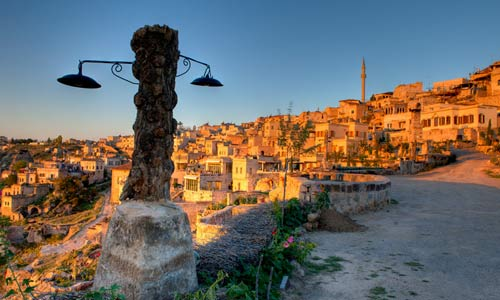 You will be met on arrival and transferred to your hotel in Uçhisar, a small picturesque village in the Cappadocia Region. Guides and representatives are not admitted to the customs area, so please pick up your own luggage and proceed to the exit through customs. You will have time to settle into your room, unpack and rest, before your welcome dinner tonight at the hotel. If you enjoy good wine, we recommend trying one of the Kalecik Karasi or Corvus reds. Over the next three days, we will participate in a variety of activities. Travelers who have reserved the optional, early morning hot-air balloon flight will depart, like all balloonists, at dawn when the air is still. For those that have decided against a balloon flight, we highly recommend waking up at sunrise to watch more than a hundred balloons pass by the hotel through the canyons. Depart for a brisk hike through the vineyards in the delightful Red Valley of Cappadocia. This beautiful valley gets its name from the rose-colored rock that varies in hue and intensity. Find the "secret" stone cathedral and climb into other beautiful and mysterious rock churches. From the end of the valley we will walk to the nearby village of Cavusin. Visit an underground city. These troglodyte cave-cities were excavated as early as Hittite times, and expanded over the centuries as various marauding armies traversed Anatolian search of captives and plunder. There are around 100 underground cities in the area although only a few are open to the public. Take a vigorous hike through the fascinating geology of Cappadocia. The trail runs through orchards and gardens and by hidden rock churches and cave dwellings. Enjoy a grand, well-earned picnic in a secluded glen accompanied by a local musician. Visit the Goreme Open Air Museum, which was the most important monastic center in the area. A long ride across the Anatolian Plain, the breadbasket of Turkey. As you roll along the Silk Road, you begin to appreciate the vast difference between your mode of travel today and that of 13th century Seljuk traders poking warily along by camel. Your first stop is at Sultanhani Karvansary west of Aksary. Next, visit Catalhoyuk, regarded as the first urban center in the world (at 7000 BC). This very early Neolithic site was first discovered in the late 1950s and became famous internationally due to the large size and dense occupation of the settlement, as well as the spectacular wall paintings and other art that was uncovered inside the houses. Stop at Konya to visit the museum tomb of the mystic Jelal ud-Din Rumi, or Mevlana, founder of the mystic Sufi order known for Whirling Dervishes. Continue on into the Taurus Mountains, heading to the Turquoise coast. En route you'll pass the town of Manavgat and continue until the turnoff to the huge, well-preserved theater of Aspendus. After visiting this impressive Greco-Roman site, you'll return to the main highway traveling southwest as we go into Antalya. Your new home for two nights is a charming boutique hotel in traditional Ottoman style, located in Antalya's historic Kaleiçi neighborhood. This morning hike up a steep, forested canyon to explore one of the most dramatically situated sites of all antiquity. Termessos is set on a mountain top with a commanding view of the area much like Machu Picchu that was built at least 2000 years later. After lunch, visit the Antalya Museum. Exhibits include artifacts collected from local, south coast, and mountain excavations dating from prehistory, including the Lower Paleolithic through the Late Bronze Ages. The collection from the 12th century BC through the classic periods, together with ethnographic displays, enhances our understanding of Turkey's complex history. Afterwards, you are on your own to explore Antalya and have dinner on your own tonight. Enjoy a leisurely morning before heading south along the Turquoise Coast to explore the ancient site of Phaselis. 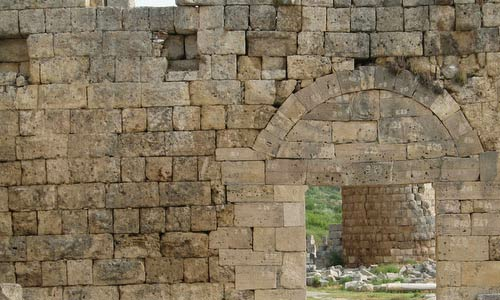 Along the spectacular coastal road, stop at Myra to view its rock tombs and fine theater. We'll visit the nearby Church of St. Nickolas where the story of Santa Claus began. Afterwards, you'll drive to the nearby port of Cayagzi, then board the gulet that will be our home for the next five nights. We sail west to Kekova Roadstead to visit the hillside village of Kale, formerly known as Simena. Explore its castle and try our hand at rolling out gözleme (borek), a tasty crepe-like traditional treat sprinkled with spices and feta, and baked on an inverted wok. 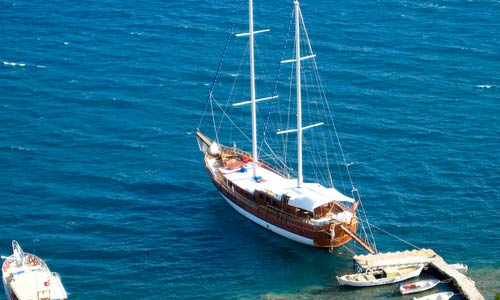 All meals will be served on board the gulet during the cruise. We sail early, moving slowly along the submerged ruins of the sunken village, then turn westerly towards the charming village of Kas. After a leisurely shore visit we cruise to Gemiler Adasi (Island) where the Knights of St. John built a castle and monastery along the route of the Crusades. We explore the remains of several churches and a monastery, and ponder the purpose of a mysterious covered passageway that runs for nearly a thousand meters along the spine of this narrow island. We overnight in its protective anchorage. We have a vigorous hike to the village of Kayaköy that was deserted in the aftermath of WW I. Over a cool beverage and a warm gözleme, we'll talk of the post-WW I events that led to Kayaköy's abandonment. You may choose to remain on board to read, swim, or snooze instead. After lunch we sail along the coast to visit the charming village of Göcek. After the visit, we may cruise on to the trailhead at Cleopatra’s Bath where we anchor for the night. We disembark for a scenic yet challenging morning hike through the pine forests to the mausoleum at ancient Lydae. If you choose not to hike, you may remain on board as the gulet cruises around the peninsula to anchor. As you wait for the hikers at the end of the trail at Agalimani you may swim or just relax. In the afternoon we cruise to a peaceful cove on the Bay of Ekincik where we anchor for two nights. This morning we disembark onto an African Queen-style put-put to motor past Iztuzu Beach, a long sand spit, now a protected loggerhead sea turtle nesting site, and meander through the silt marshes and cattails up the Dalyan River to visit the Lycian site of Caunus. 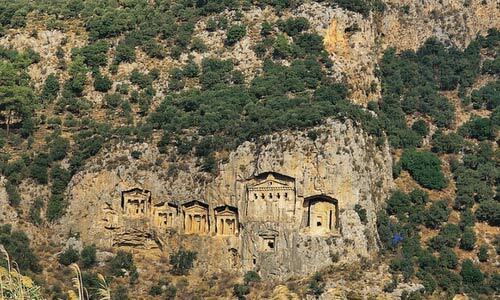 On the way we will see the huge rock cut Lycian tombs carved into the cliffs. In Caunus we visit a Roman theater, bath, and agora dating from the 2nd century BC. The hikers among us will head over the peninsula on a three-hour hike to the lovely Bay of Ekincik. Everyone else will go into the little village of Dalyan for bit of shopping before rejoining the gulet in Ekincik Bay. Dinner will be on board or you may elect to dine ashore, on your own, at one of the fine restaurants overlooking the bay. After breakfast on the gulet we drive north through farmlands and pine-forested mountains to visit the Temple of Zeus at Euromus. After a brief visit, we continue to the Aegean coast to explore the remains of the enormous Temple of Apollo at Didyma. After learning about ancient fortune-telling and the Greek oracles, we continue north to the Menderes (ancient Meander) River delta and Miletus. From here, we continue north to visit ruins of the impressive Greek city of Priene with its grid system of streets. In the late afternoon, we arrive in Sirince, the "Tuscany of Turkey," a historic village located in the hills not far from Ephesus where we spend two nights in a historic property. You will have time to settle in to your charming hillside accommodations at Nisanyan Houses before we meet for dinner. We depart in the morning to explore Ephesus, the largest Greco-Roman site in the world, and if reopened in time, the Ephesus Museum at Selçuk. You will have the entire day to take in this magnificent site. We will be visiting the following sites around Ephesus: the Basilica, the House of Virgin Mary and the Temple of Artemis, another ancient Wonder of the World. We will have lunch in Selçuk at a small typical restaurant. In the evening we will return to our hotel before dinner. After breakfast we depart to the Izmir Airport to catch our mid-morning Turkish Airlines flight to Istanbul, a crown jewel among cities, where we begin our wonderful days exploring legacies of Greek, Byzantine, and Ottoman civilizations. We start right away on arrival to develop your sense of Istanbul’s amazing layout. We pass the massive Byzantine walls that span the peninsula from the Sea of Marmara to the Golden Horn. These walls both defined and protected Constantinople until breached by the Turks in 1453. From there we head for our hotel where we will luxuriate in the heart of old Istanbul, the Sultanahmet, for four nights. We keep a flexible schedule with respect to the order of events in our exploration of Istanbul. Weather, group interest and energy are all taken into consideration. Here are our best intentions and we usually do them all—and then some! During the next three days, you’ll explore the Sultanahmet, visiting the Blue Mosque, Aya Sophia, and the site of the ancient Hippodrome where we see the great obelisk brought from Egypt by the Romans. We enjoy a cruise on the Bosphorus, and visit Taksim Square—one of the highest points in Istanbul. We stroll down Istiklal Caddesi, a historic commercial and residential street open only to pedestrians and its cute little red trolleys. For a sweeping 360° view of Istanbul, including the Asian side, we climb the Galata Tower, built by the Genoese in 14th century. Drive through an old gate in the triple Byzantine wall to visit the Kariye Cami’i or Church of St. Savior in Chora, renowned for its magnificent mosaics and frescoes. you'll explore Topkapi Palace, the seat of the Ottoman Sultans for 400 years, and visit the Suleymaniye Cami’i—a vast religious and educational complex built for Suleyman the Magnificent by the great Turkish architect Sinan. In the Spice Bazaar, you'll find a cacophony of sights and sounds as we stroll through its warren of passages. The marvelous Rustem Pasha Mosque, located in the heart of a bustling marketplace, is one of the finest examples of the architecture of Sinan. Wander through the Grand Bazaar where you’ll have some time on your own to shop, visit the splendid Archeological Museum, Museum of Turkish and Islamic Arts, the Mosaic Museum, have a Turkish bath, or just savor the aromas and sights. Transfer to the airport with check-in to your homeward bound flight, unless you are remaining for more adventures.